Mini chocolate souffles – clean eating dessert! 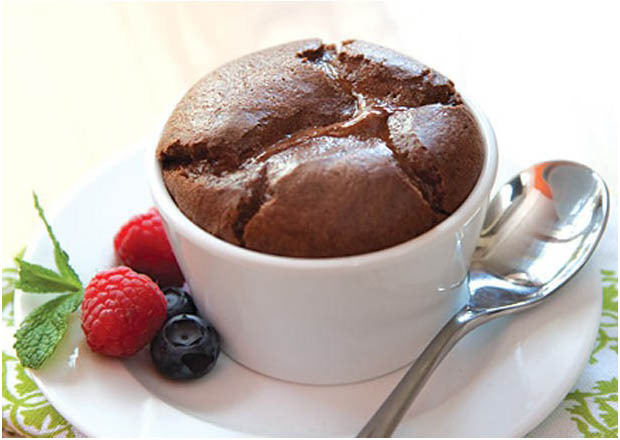 These delicious chocolate soufflés are pure indulgence without the guilt. Egg whites, cocoa powder, and honey keep this treat clean without sacrificing flavour. Tip: serve the souffles with fresh berries to add fibre and vitamins. 2. Lightly spray the bottoms of four single-serve ramekins or soufflé cups. 3. Combine the cocoa, flour, milk, and 3 tbsp of the honey in a pan and whisk until smooth. 4. Cook on low-medium heat until thick (approx 2 minutes) while stirring continuously. 5. Stir in the vanilla and set aside to cool slightly. 6. Place the egg whites and cream of tartar in a small mixing bowl and beat until soft peaks form. 7. Gradually beat in the remaining honey and continue beating at a high speed until stiff peaks form. 8. Fold the egg whites into the chocolate mixture. 9. Divide the mixture evenly between the prepared ramekins. 10. Place the ramekins on a baking sheet and bake for 15 minutes, or until puffy and set. This sounds too good to be true, the only way to find out is to put it to the test, I shall be donning my apron tonight and I will let you know as soon as I’ve eaten the lot…. obviously after a decent workout!